The video was made in 2014, but it was widely reported this week. So they are concern that it could have now the bad consequences that it didn't have back then. 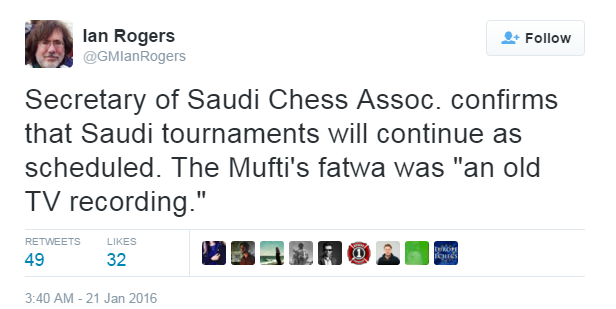 From his Twitter feed prior to his email to David Llada, it seems pretty clear that Mousa Bin Thaily, a committee member of the Saudi Chess Association, also didn't know that the video was an old one. Perhaps, after his solo African flight and anti-feminist comments, Nigel Short has moved into the category of celebrities where any outrageous comment he makes can be used as click-bait and doesn't need to be fact checked, especially when his false claim - a Saudi ban on chess - fits with the current narrative about how bad the current Saudi regime is. The thing is that even prior to Musa Bin Thaily realising that the video was old, he'd neither stated that chess was now banned in Saudi (though he was clearly aware that such an event was possible) nor suggested that members of his association were in any danger. The difference between something potentially happening and it actually happening is really quite important, it's something that is very often not clear when a story first comes to the word's atte ntion and that's why there's a need to check, if only to avoid having egg on one's face in the morning. I'm reminded of the claim rouhgly last time this year that chess was to be compulsory in Spanish schools. It wasn't true, though at the same time it was based o nsomething real that had actually happened. But still, it wasn't actually true. I am a Swedish chess player having found your blog quite recently and now reading up on some (most, actually) of your old posts. So far, I have come as far as early 2008, which means I have some more interesting reading before me. Yet, there is an issue. For some post, presumably those with a game viewer, the post takes a little longer to load, and when it has finished loading I am redirected to an error page (chesspublisher, something). So far, this has happened to me over the last couple of days when trying to access some 5-10 posts from January and February, 2008. This might or might not be something you wish to investigate, but I thought I should let you know about it. Also, I could mention that most of the game viewers of your pre-2008 post (and, potentially, those of later posts that I have not yet read) do no longer function properly. Nevertheless, please do keep up the excellent work you put into this blog! Man with beard would ban chess on religious grounds if he had the power to do so. That is what the chess world is reacting against. Evidence so far is that he doesn't have the power. His religious rivals in another state had the power and did ban chess, although they eventually relented. Thanks very much for your message. Yes, we’re aware of the game replayer problem. Unfortunately it was such a big job we took ages to get around to trying to fix it. Then when we did we had problems accessing the pages to edit them for the same reasons as your’e found trying to read them - the error/virus warning pops up and then we get a redirect. So we gave up. Sorry. The good news: for several years we’ve been using a different game replayer which has proved reliable. Not sure when that kicks in, but it feels like it’s been ages now. Thanks again for your email - and also for being kind enough to read our old posts. You definitely go into our readership Hall of Fame for Dedication Above and Beyond the Call of Duty.